Voltec Power and Lighting manufactures a full line of RV products, from molded adapters and cords to inverters and generator adapters. Our patented E-Zee Grip series offers a premium product to customers with ungraded features at a great price. Our point of purchase displays and NEW E-Zee grip set make marketing easy! Voltec Power & Lighting is a UL registered firm, with products listed for UL, cUL, and ULus. Our commitment to quality has earned us both ISO 13485 and ISO 9001 rating for quality control and excellence in manufacturing. This PVC triangle adapter with solid brass through contacts adapts RV 30 AMP to 15 AMP. Bulk. All Voltec products are backed by a limited lifetime warranty against defects in manufacture. Voltec's park adapters are constructed of high quality PVC and they features superior insulation. 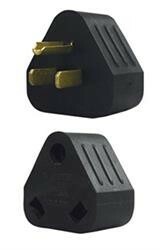 This adapter is used in campgrounds and recreation areas and the contoured shape provides an easy removal from outlet.